Today’s the day when Google revealed officially their latest Pixel line of smartphones, but they also made a big deal about another cool thing, Google Store Financing, which is not limited to smartphones. Considering the price tag of the new droids, a second mortgage on the house seems like a plausible strategy if you’re that type of geek who wants to put his/her’s greedy little hands on Google’s latest spyware ASAP. 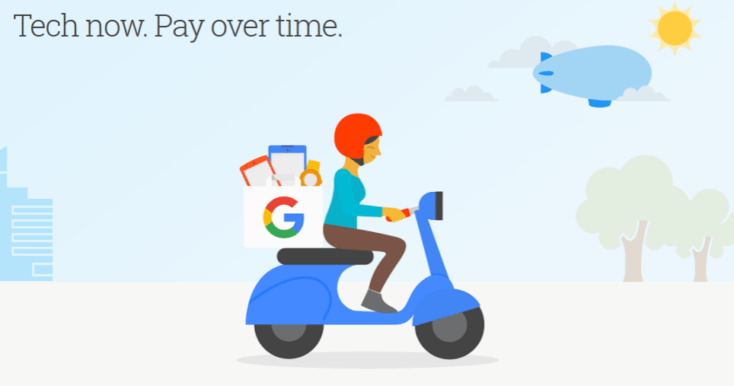 Here Google Store financing comes into play, and if you just read their motto you’ll understand what’s behind our news story in a jiffy: tech now, pay over time. Do you know what that means, right? Instant gratification baby. The idea is that you can grab now the Pixel or the Pixel XL and don’t worry about actually paying for it. Google Store will finance the deal after taking a glance at your emails, metadata and bank account and if you’re eligible, you’ll be able to benefit from a 2 years settlement, i.e. 24 monthly payments. That sounds convenient, doesn’t it? Especially considering the price of a Pixel smartphone, which is $649 or more. Hell, I know people driving cars which aren’t worth that much. Another interesting thing is that Google’s generous financing plan is not limited to smartphones. Google Store financing will be extended to basically any type of purchase, with a caveat though: you’ll have to meet certain pricing criteria, to please both Google and Synchrony Bank (their partner in crime and the party which actually takes care of the financing per se via fractional reserve). If you want to benefit from a 6 month financing, you’ll have to purchase stuff amounting to $150-$299. For a 12 month financing, you’ll require to buy anything above $299 and so on and so forth. Long story short, Google Store will offer you financing possibilities for any purchase north of $150.